Organized by Efrain Lopez Gallery at Rhona Hoffman Gallery. Henry Chapman, Moab, 2017, oil, acrylic, silk-screen ink on canvas. Within my work, an imperfection is a failure when it is a symptom of my uncaring, and an imperfection is a success when it helps a piece find its own life. The works of Martha Tuttle and Henry Chapman both evoke a meditative quality and quiet stillness that appear distant from today’s loud and fast society of spectacle. There’s an alchemical beauty in the layering and draping of hand spun wool and other natural fibers in Tuttle’s tactile compositions. In some pieces, she paints silk with a dusting of black and grey graphite that complements the earthy hues of the incorporated swaths of handmade wool. Chapman’s large-scale paintings recall the interplay between visual form and language found in concrete poetry. With subtle depth and texture on the white expanse of his heavily gessoed canvases, he combines fragments of screen-printed, partially autobiographical texts with an economy of paint spills and the ever so slight echo of a brushstroke. 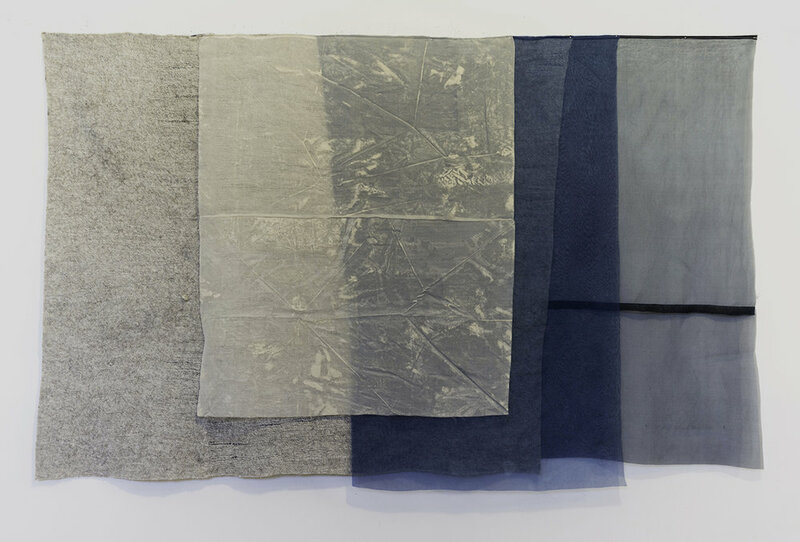 Although Martha Tuttle’s practice is firmly rooted in a conversation about painting, she works primarily with fiber-based materials, using an array of textile techniques such as spinning, weaving and dyeing. She combines pieces of handmade wool and industrially produced silk dyed with indigo, walnut, ink and graphite to create her paintings. Her material investigations into the unique qualities of wool expand her formal and conceptual interests in painting to an exploration of the permeable networks between animals and the natural world. Many of her works begin with the process of spinning wool using a drop spindle, which allows for a variation of line depending how she uses her body to spin the raw material. Once the wool is woven, washed, and pounded, it creates surfaces of wavering density from which she selects and augments these materials to compose her paintings. Tuttle describes being drawn to the variation of material that comes with the practice of spinning wool: “The wool that I use is from the New Mexican Churro sheep, and the color changes depending on something as seemingly inconsequential as the distance from one valley to another.” In other words, the same sheep could produce five different colors of wool depending on which valley it grazed in. Not quite a collaboration between man and nature, but it lies somewhere along those lines. This relationship recalls Donna Haraway’s preoccupation with the tangled networks of human and animal relations, or even Rivane Neuenschwander’s early works like Carta Faminta (which in Portuguese could mean either starving letter or starving map), where the artist created compositions that resemble continents, which were created by the eating patterns left over from a snail’s meal—a kind of automatic drawing with nature. Similarly, Tuttle’s work is intimately engaged with notions of touch and the fluidity of form. In her recent series of paintings Like Water I Have No Skin (a direct reference to essayist Gretel Ehrlich), Tuttle combines swaths of handspun wool and silk painted with grey and black graphite, and stretches them onto traditional wood frames. She has recently decided to incorporate industrially woven silk components and dyes them with indigo, walnut, and ink. The artist describes her choice to weave together the machine-made and handmade fibers saying, “I am interested in how the consistency of standardization can create a discourse with the inconsistency contributed by my hand and body.” Emphasizing the tension between difference and repetition echoes throughout many of her other works. Her compositions also play with the opaque versus translucent qualities of the different fibers, and at times her aesthetic decisions create color gradients that are formed by the overlapping materials. The muted colors and somber palette of her paintings give these works a ghostly presence comparable to the quiet confidence of a burial shroud, particularly in larger unstretched works such as Weather 6 (2017). Henry Chapman’s series of large paintings comprised of oil, acrylic, and silkscreen ink on canvas include the technique of layering spills of paint, which visually mirrors the overlapping fibers in Tuttle’s works. Within the past few years, Chapman shifted to painting on larger six-foot tall canvases with the intention of relating the size of the canvas to his own body. The effect of the scale and layering spills of paint appear to quote Morris Louis’ iconic stained canvases. However, unlike a color field painting, from afar, it’s the sheer expanse of negative space on Chapman’s canvases that is most notable and draws the viewer closer. Upon approaching the work, one notices fragments of texts, sentences here and there, and at times whole paragraphs that appear on the canvas where one might expect a brushstroke of paint. His recent body of work considers the relationship between writing and painting. In early 2016, he began incorporating prose accounts of his travels in Europe, China and the Western United States into his practice. The artist screen-prints sections of these texts onto stretched canvas surfaces that he meticulously builds up with layers of gesso. (He often creates a preparatory sketch of the compositional structure beforehand in order to determine the layout of the text.) Among the aforementioned color spills are mysterious excerpts that appear to float on the surface of the canvas due to the wavering density of the lettering. According to Chapman, “ . . . such surfaces absorb and hold ink, which appears to be both within and on top of the surface. Material choices like this allow me to imbue the writing with as much physicality as the painted marks around them.” This effort he describes toward drawing a stronger relationship between the painting and the body is also evident in his decision to liken the canvas to a page from a book, offering a layer of intimacy between the viewer and the work. Some of the passages in the paintings are derived from excerpts of Chapman’s travelogue correspondence with Tuttle, including the two smaller paintings 4:30 or 5 (2017) and Samantha (2017) (both twenty-six by twenty-three inches). Both works are loosely inspired by John Cage's indeterminacy writings. Whether ideas are communicated in the nature of the writing or spills of paint, Chapman is interested in invoking chance and potentially the happy accident of “errors” that produce variation. Chapman and Tuttle toil over the degree to which chance and control impact their works. Perhaps the bleeding pool of pigment on one of Chapman’s canvases becomes unwieldy, or Tuttle’s weaving looks too perfect and loses its hand-spun character. There is a necessity to find a balance between these forces visible in their works. Both artists share an interest in the tension between the mechanical and controlled in relation to the handmade and gestural quality of their work. This is at the heart of the work of their mutual source of inspiration Agnes Martin; some have said that the imperfections in Martin's hand-drawn lines allow her paintings to “breathe.” In this way, Tuttle and Chapman’s works could imbue a metaphysical conceit where what it means to be human might lie exactly in those imperfections or variations that give way to life: An Agnes Martin grid wouldn’t be an Agnes Martin grid were it not for the ever so slight wobble of a hand-drawn line.